Okay, so the world kind of ended...Zombies roam the streets in search of brains, gangs of mutants and killer clowns stalk the back allies and all seems lost for the lonely survivors. How could it get any more chaotic...corporate Ninjas, that's how! Once living in the shadows, Ninjas have come out of the twilight of myth and actively ply their trade to the highest bidder...it matters not to them the morality of the cause or the integrity of the victim, they operate for profit...be it goods or credits or other commodities. Have you had a hard time knocking out that rival gang leader? Hire a corporate Ninja. Can't seem to get to that stubborn survivor sitting on a hoard of loot in his fortified home? Hire a corporate Ninja. Is your second in command feeling a little too much like he should be in charge? Hire a corporate Ninja. 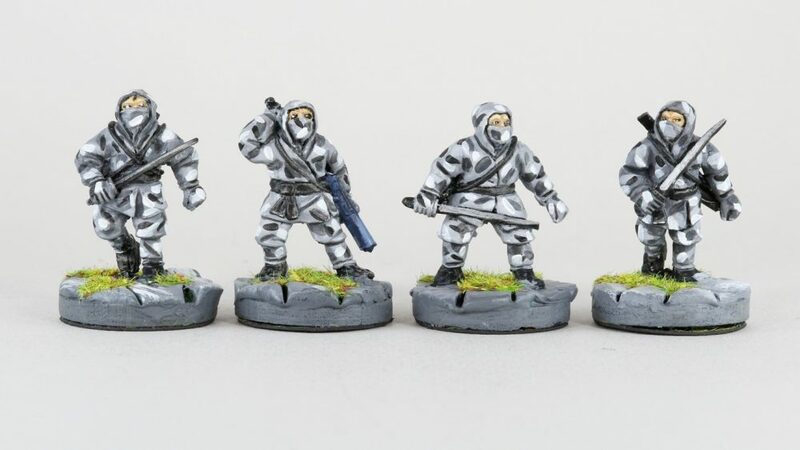 Pontonier Miniatures are available exclusively from Badger Games. This entry was posted on Thursday, April 12th, 2018 at 13:44 and is filed under News. You can follow any responses to this entry through the RSS 2.0 feed. You can skip to the end and leave a response. Pinging is currently not allowed.